Our youngest son will soon take his first steps. Once he learns how to walk, his feet will take him many places. 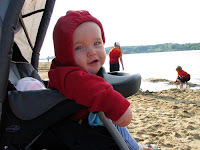 When he's old enough, he may choose to line up with his older brothers and compete in his first youth triathlon. walk (45 minutes), you can finish your first triathlon. A sprint distance triathlon usually includes a .25-mile swim, 15-mile bike and 3.2-mile run. Depending on your goals, and your current fitness level, you can train for a sprint-distance race in 4-6 hours a week, for 6 weeks, as long as you train correctly. Since fitness is specific, you must swim, bike and run. And, you must add time, distance and intensity gradually to avoid injury. Love your feet. Wear proper shoes. Running stores can help match you up with the best shoe for your foot. Don't race in brand-new shoes or clothing, try all gear and nutrition out first while training. Each step counts. Your pace is your business. Great news, each step gets you closer to that finish line! You will get there! Your legs will feel really heavy. After you get off the bike your legs may feel heavy or a little clumsy. Stay with it and just keep going, it'll get better. And, if you need to, take time to stretch out a little. Smile and encourage someone. Triathlon is known for its camaraderie. Help other first-time racers get to their first finish lines. Make it a memorable race! What if I get a cramp? Active Expert Gale Bernhardt discusses race-cramps and workout plans. What if I get a side stitch? Click here for advice. What are three common running mistakes? Check out this Runner's World advice. Don't worry, don't fret, just get outside and give it a try. Take a walk, jog or run down the block. Surprise yourself! Remember my friend Mary, it's never too late to get started doing something new. Please tell me how those first steps go! I love walking but I've never been great about running. Still, your posts are very inspiring!